This is another one of those programs where you say to yourself, "Better grab this one or you'll kick yourself forever if you don't". This is the only Traverse City Bays program I have seen online or anywhere. The second I saw it on eBay, I grabbed it. Paid more than I usually do, but it was worth it. The Traverse City Bays were a team in the United States Hockey League. The USHL was a semi-pro outfit that was a notch or two below the IHL until 1979, when it switched to junior hockey. The Bays played in the old Glacier Dome, which is now owned by Cherry Capital Foods. 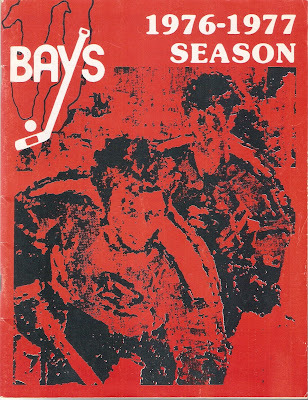 In their inaugural season, 1975-76, the Bays had a respectable 24-23-1 record, good enough for second place in the Northern Division, 16 points behind Green Bay. Their sophomore season, however, was a big step back. Despite having former NHLer Dean Prentice as player-coach, the Bays collapsed to a 12-35-1 mark. Their 25 points were easily worst in the league, and 35 points behind 2nd place Green Bay. With a record like that, the Bays struggled with putting the puck in the net and keeping it out. It's meager 205 goals were the lowest in the circuit, though they did have 3 player score over 20 goals. Traverse City was led by John Preville, who scored 35 goals and 78 points. Reese Dobrick (30 goals) and Ray Tonelli (27) were the other two 20+ goal scorers. Prentice, doing double duty as player-coach, contributed 5 goals and 27 points. On defense, the Bays surrendered 328 goals, easily the worst in the league. The team went through about 11 goaltenders, a stunning number considering the USHL schedule was only 48 games! The Bays opponent that night was the Milwaukee Admirals. The Admirals would jump to the International Hockey League shortly after this season, then join the American Hockey League in 2001 after the IHL folded. As for the Bays, they weren't as fortunate. Citing low attendance and financial difficulties, the team folded after only two years of play. Traverse City would be represented by two mid-level junior teams, but would never again be home to a pro hockey team. This program has 20 pages, not too bad for a semi-pro team in a small town. It also has an issue of Goal: The National Hockey League Magazine in the middle, which nearly doubles the size of the program. There are pictures of the players and front office staff, and rosters for both the Bays and Admirals, but mostly the program is advertisements. Still, it's easy to call this one a rare program.